My New Years Resolution this year was to participate in Tim Holtz's 12 tags of 2016. 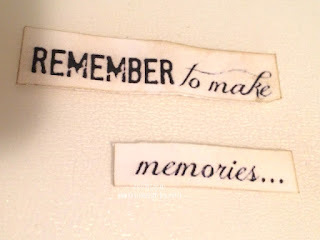 My blogger friend Nicole Wright Designs inspired me to take the plunge after seeing all of the beautiful tags that she had made last year. 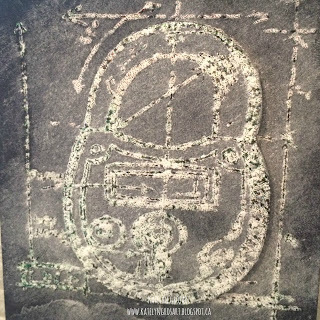 This year for Tim's 12 tags, it's all about remixing past techniques and combining them together with other techniques that he has used over the past years. 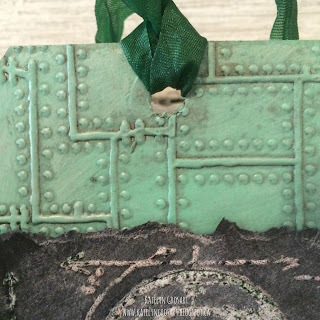 This month's tag features the chalk technique and distressing metal. For this month's tag, I decided that I wanted to use the lock stamp from the Industrial Blueprint stamp set. The chalk technique has become one of my new favourite technique to use. I used Holographic embossing powder instead of Frosted Crystal to complete this technique. I stamped a second lock and cut just the lock part out and foam squared it over top of the other chalked lock. 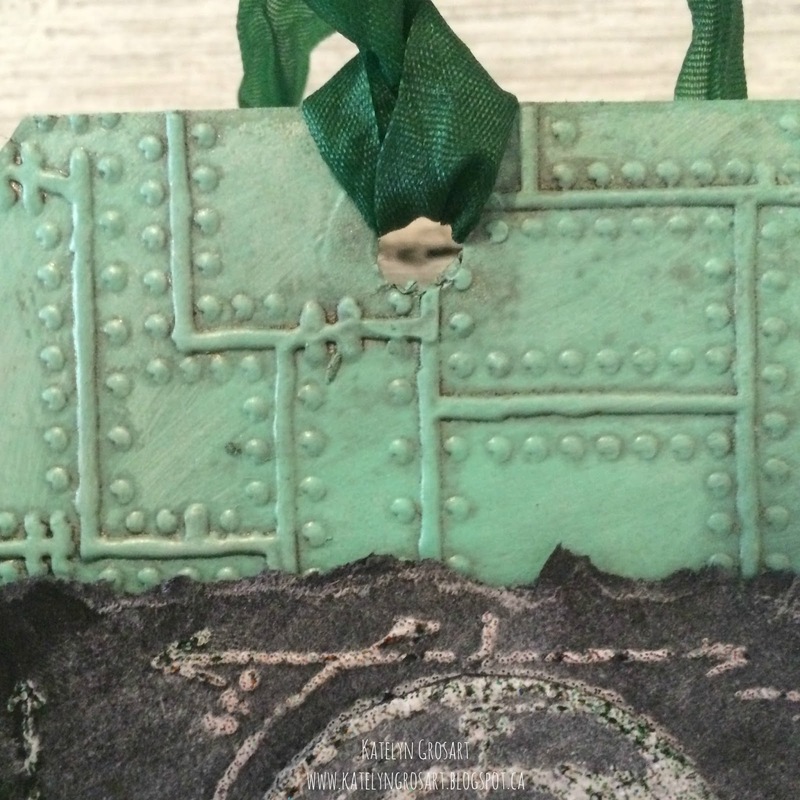 To create the effect on my faux embossed metal, I used the Riveted embossing folder. I covered the embossed faux metal with a layer of Cracked Pistachio Distress Paint. 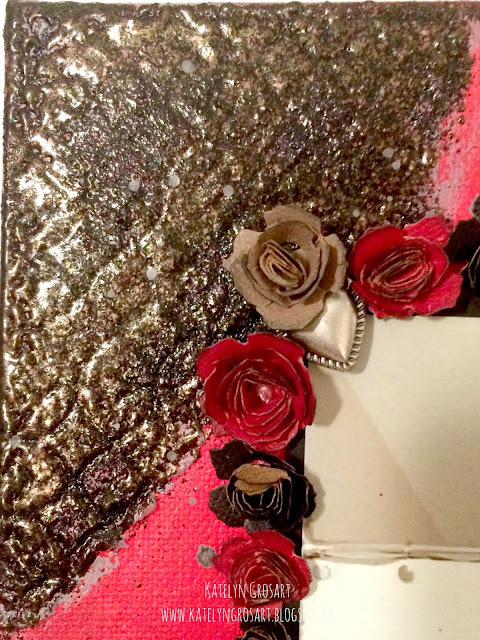 Once the Distress Paint was dry, I added a light layer of Mushroom Adirondack Alcohol Ink overtop to highlight parts of the embossed faux metal. I didn't have any word bands on hand, so I improvised and used one of the sayings out of the Ideology Small Talk stickers. I love how my first tag turned out and I can't wait to try out next month's tag! 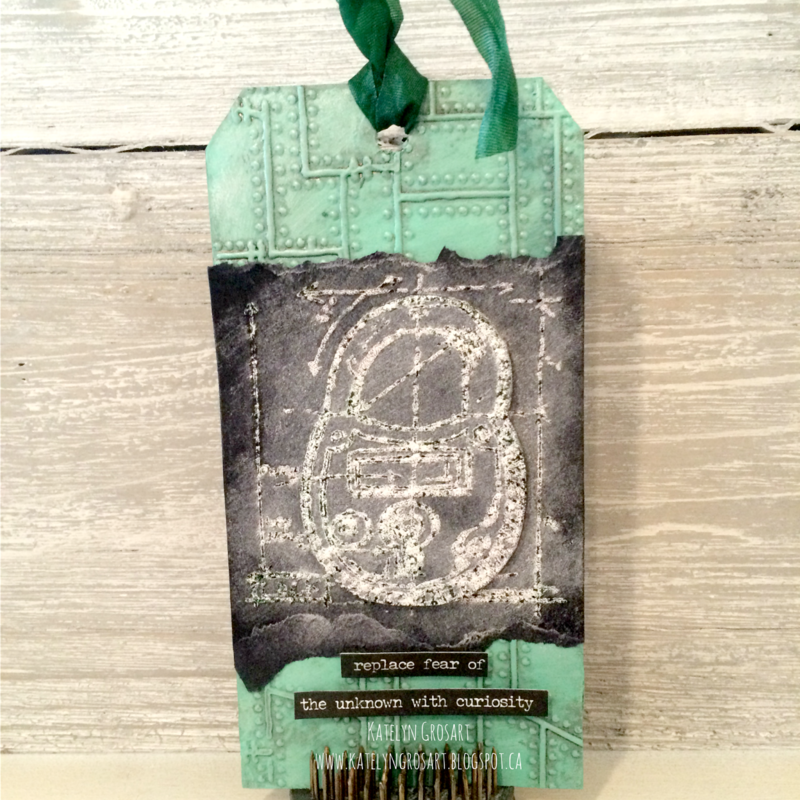 Thanks for stopping by and checking out my first 12 tags of 2016 inspired by Tim Holtz. I'am back on the Southern Ridge Trading Company blog today to feature a "Winter" inspired project . There is still six days left to enter your "winter" piece into our Monthly Challenge and we would love to see you project. For all of the details, head here. For my post today, I created a winter canvas. Supplies Used: Ranger/Tim Holtz - Ground Expresso Distress Ink, Distress Crackle Paint - Clear Rock Candy. Ranger/Dylusions - Dylusions Paint: White Linen. 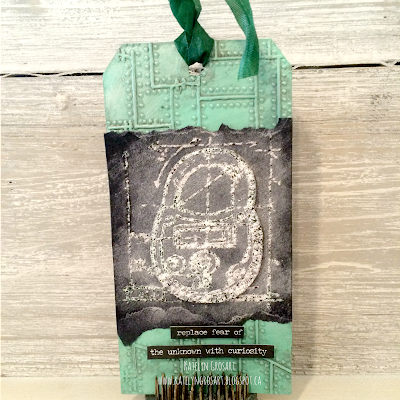 Sizzix/Tim Holtz - Holiday Words: Block. 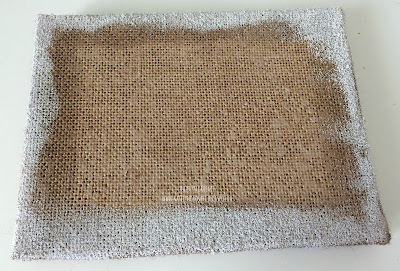 Tim Holtz Ideaology - 6x8 Burlap Panel. Emerald Creek - Iridescent Shimmer & Soft Fallen Snow Embossing Powder. Viva Decor - Inka Gold: Old Gold & Brown Gold. Tsukineko/Imagine Crafts - VersaMark. Bo Bunny Sleigh Ride - Blizzard, Logs & Tradition. Bazzill Cardstock - Java. May Arts Twine - White. To begin, I prepped the background of my burlap panel, using a blending tool and inking 1/2" in around all the edges of the panel. 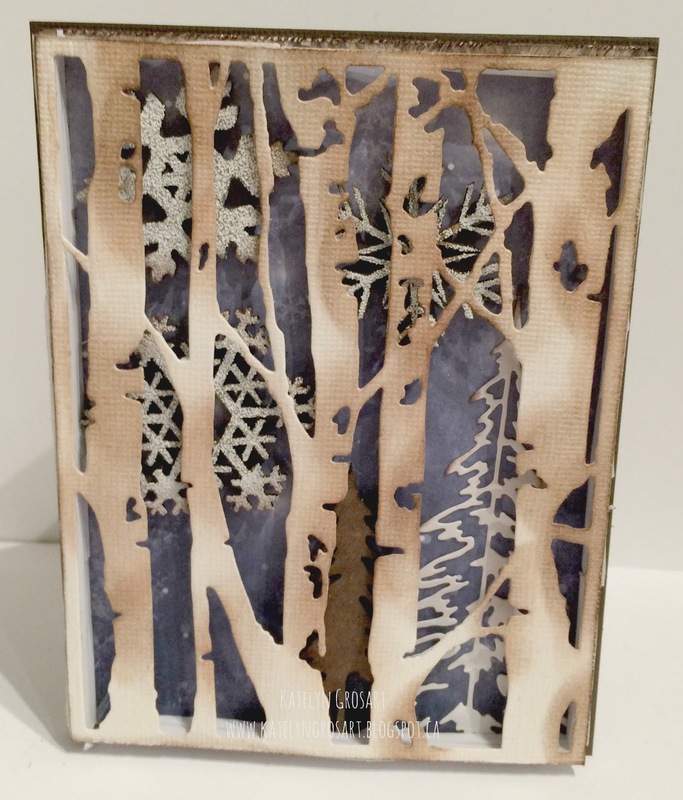 Once the edges were inked, I sprinkled Soft Fallen Snow Embossing Powder around all four edges and embossed them. Once the background of the panel was finished, I set it aside and started working on the Cedar Trees. I covered all three cedar trees with Brown Gold Inka Gold. Once the Inka Gold was dry, I covered each cedar tree with a layer of Clear Rock Candy Distress Crackle paint and set them aside to dry. Once the cedar trees were drying, I moved on to the Plain Banners. I covered the three plain banners with Old Gold Inka Gold. Once all three banners were covered, I applied a layer Clear Rock Candy Distress Crackle Paint over top and set them aside to dry. I wanted to add something to the plain banners, so I pulled out my stash of Mini Wood Snowflakes. Before embossing the snowflakes, I painted them with a layer of Dylusions Paint in White Linen. Once the paint was dry, I covered them in a layer of VersaMark and then sprinkled Soft Fallen Snow Embossing Powder overtop of them and embossed them. For the finishing touches on my winter canvas, I added two layers of patterned paper from Bo Bunny's Sleigh Ridge Collection. 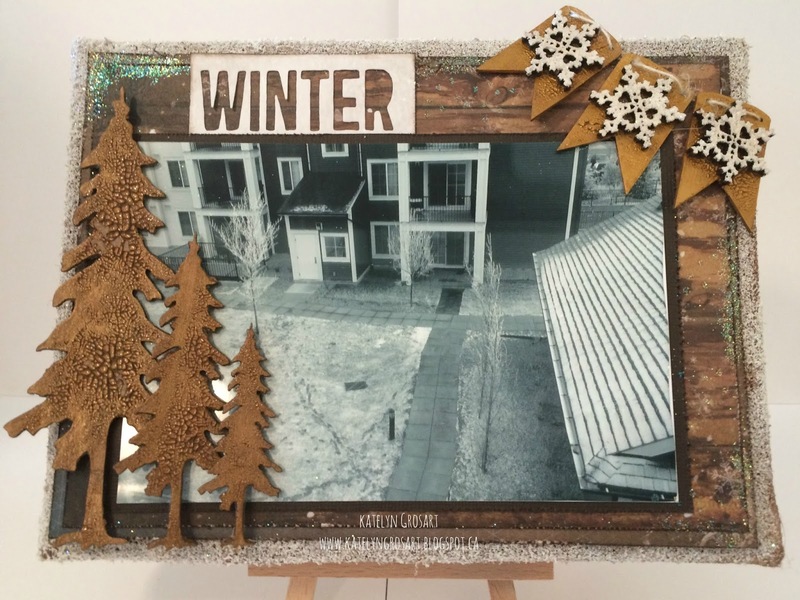 I also wanted to add the word "winter" somewhere on my canvas, so I cut it out using the Tim Holtz/Sizzix - Holiday Words: Block die, attaching it to the top of my photo. For the last of the finishing touches, I added some Iridescent Shimmer Embossing Powder to parts of the edges of the patterned paper. Here is the finish Winter canvas with all of the elements put together. Thanks for stopping by and checking out my winter canvas. Stayed tuned for some more crafty goodness. It's time for a new challenge on the Emerald Creek Dares blog, this challenge is based on Valentine's isn't in the air, focusing more on love for the single people. When we were told about the new challenge, I was excited about it as I hate Valentine's Day. 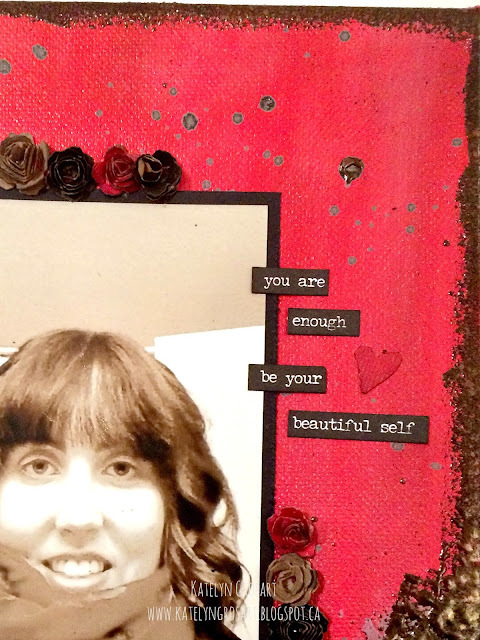 So with the new challenge in mind, I created a canvas featuring myself and how important it is to love yourself first. 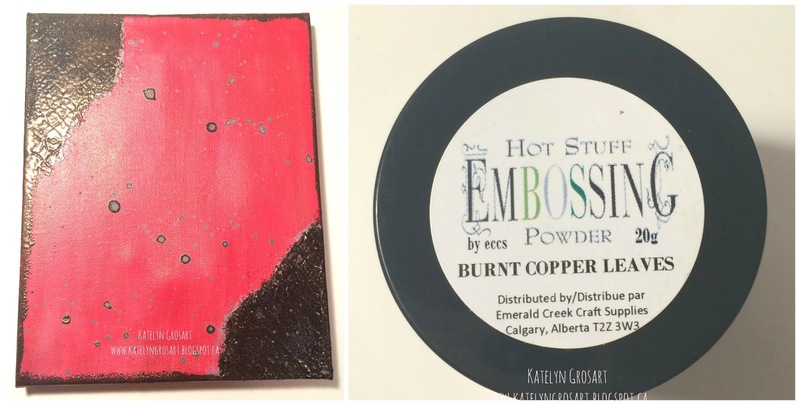 Supplies Used: Emerald Creek - Heart Brads, Burnt Copper Embossing Powder & Onyx Frost Embossing Powder. 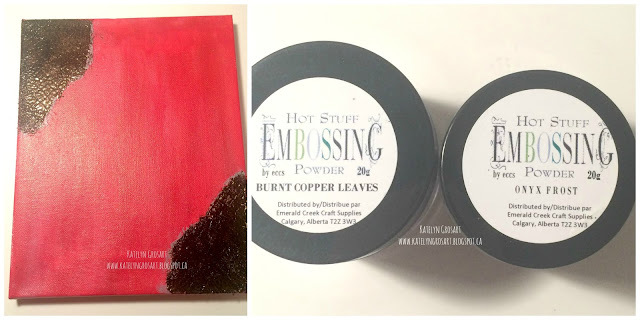 Ranger/Tim Holtz - Black Soot Distress Ink, Embossing Ink, Hickory Smoke Distress Paint & Worn Lipstick Distress Paint. Ranger/Dina Wakley - White Gesso, Spatula & Ruby Acrylic Paint. Ranger - Texture Paste - Transparent Matte. 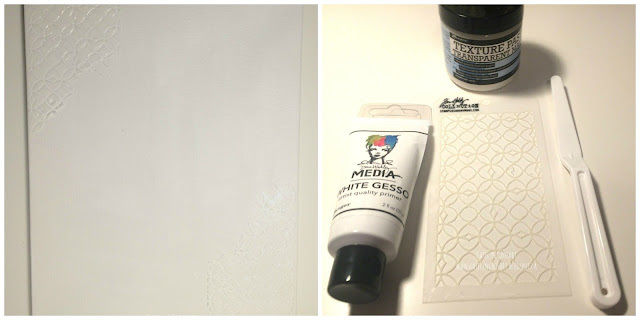 Tim Holtz - Lattice Stencil. 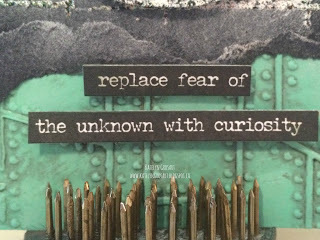 Tim Holtz Ideaology - Small Talk. 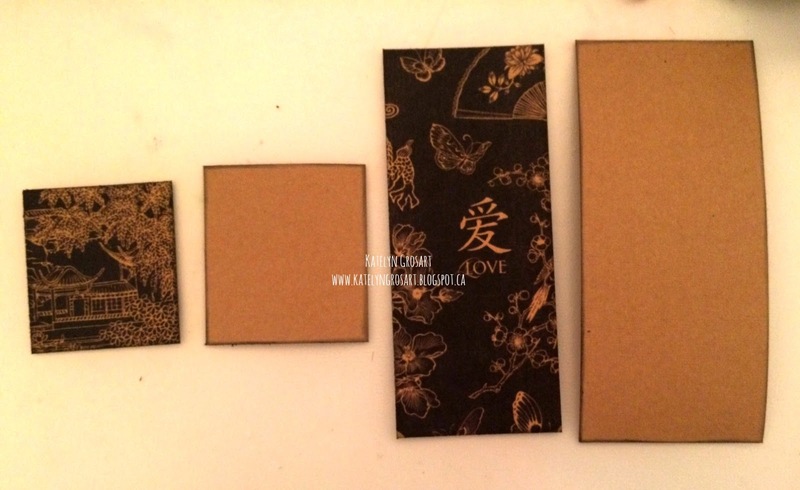 Core'dinations - Tim Holtz Kraft Core: #3, #23 & #24. Sizzix/Tim Holtz - Tiny Tattered Floral. To get my canvas ready for painting, I painted the entire surface with White Gesso. After the Gesso had dried, I laid the lattice stencil down on the top left and bottom right hand corner of the canvas and covered the lattice pattern with Matte Texture Paste. 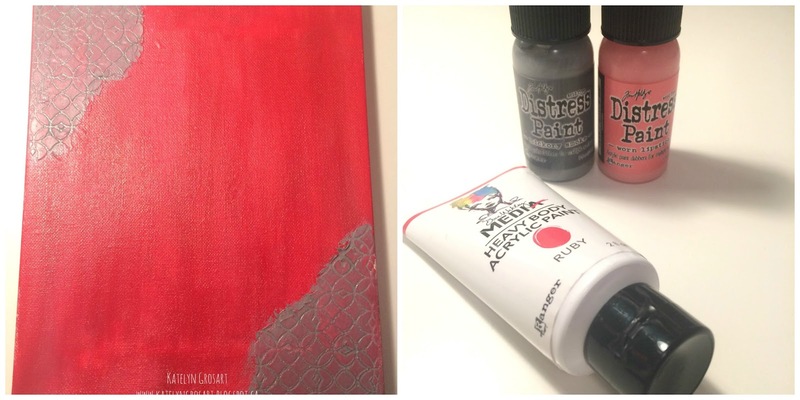 Once the stencil images were dried, I painted the entire canvas with Ruby paint. After the Ruby paint for dry, I added some Hickory Smoke and Worn Lipstick Distress paint to the entire canvas. Once the coverage was good with the paint, I wiped off some of the wet paint with a paper towel to create a custom background. After the entire custom background was dry, I used my finger to apply Hickory Smoke paint over top of both lattice stencil images. After the Hickory Smoke paint was dry on the lattice stencil images, I covered each lattice image with embossing ink. Once the embossing ink was on, I mixed Onyx Frost and Burnt Copper Leaves Embossing Powder from Emerald Creek and sprinkled over top of each lattice stencil images. When the lattice images were covered with embossing powder, I used my heat tool to emboss them. After the lattice corner were embossed, I splattered some Hickory Smoke Distress Paint over the canvas. Once the splatters were dry, I used the embossing ink around the edges of the canvas and sprinkled Burnt Copper Leaves around them. When I was happy with the coverage on the edges, I used my heat tool and embossed all the edges. Now that I had the canvas background how I wanted it, it was time to add the rest of the elements and embellishments. To start I added the picture of myself in the middle of the canvas. To embellish the corners of the photos, I added the Heart brads from Emerald Creek to the top left hand corner and the bottom right hand corner of my photo. Once the heart brads were in place, I cut out a variety of the Tiny Tattered Floral from Tim Holtz Kraft Core #3, 23 & 24. After all of the flowers were rolled, I added them to bottom right and top left hand corner of the frame, around the hearts. The last element that was added was the "you are enough, be your beautiful self and always love yourself first" saying to the right and left side of the photo. To finish the saying, I added a heart to the bottom of the "yourself first" and to the side of "be your". 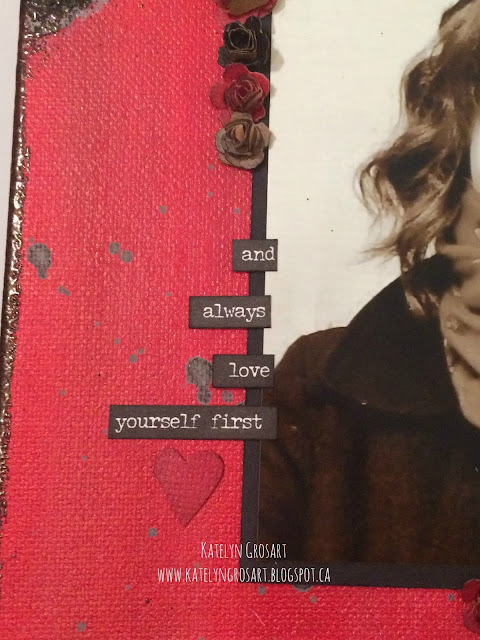 Thanks for stopping by and checking out my "Love Yourself First" Canvas. Don't forget to enter your project into our Emerald Creek Dares Challenge for your chance to win a $25.00 gift certificate for the Emerald Creek Store! It's the start of CHA today and I can't think of a better way to start off CHA by sharing a brand new release from Emerald Creek Craft Supplies featuring two new stamp sets by Nicole Wright Designs. 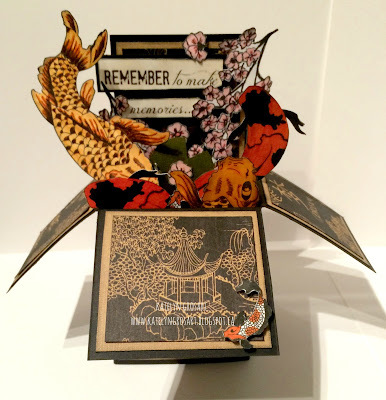 Nicole has created a beautiful Fallen Blossom stamp set and a stunning Upstream Stamp set. I can't wait to create more projects using these stamp sets. The stamp sets are available to order on the Emerald Creek Craft Supplies website. 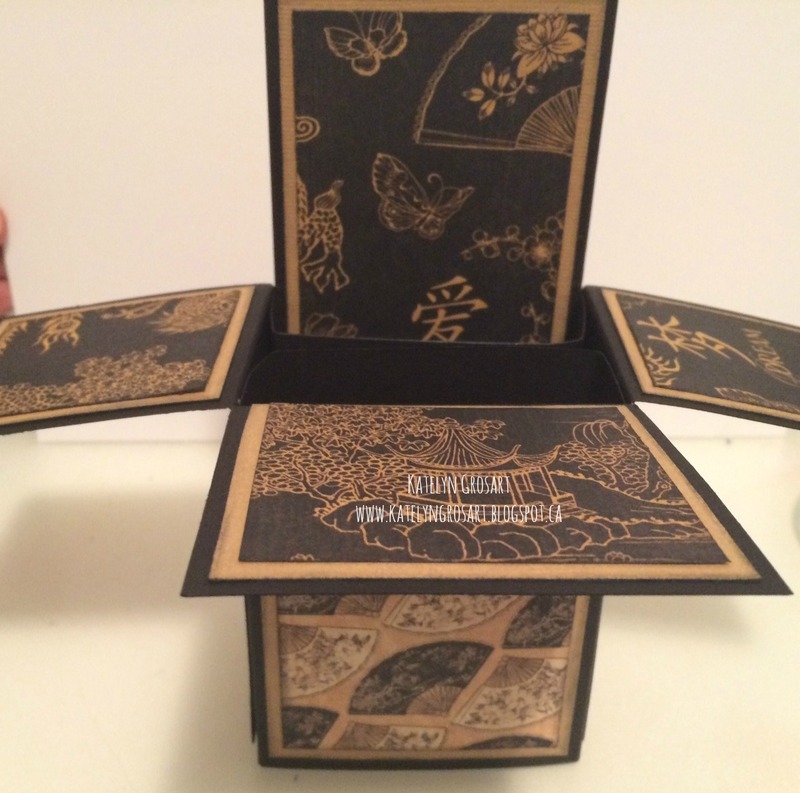 For my project, I created a Pop Up Box Card featuring the two new beautiful stamp sets. Supplies Used: Emerald Creek Craft Supplies featuring Nicole Wright Designs - Cherry Blossom & Koi stamp set. Ranger/Tim Holtz Distress Ink - Black Soot & Antique Linen. Ranger/Tim Holtz Distress Markers - Carved Pumpkin, Dried Marigold, Spiced Marmalade, Black Soot, Worn Lipstick & Spun Sugar. 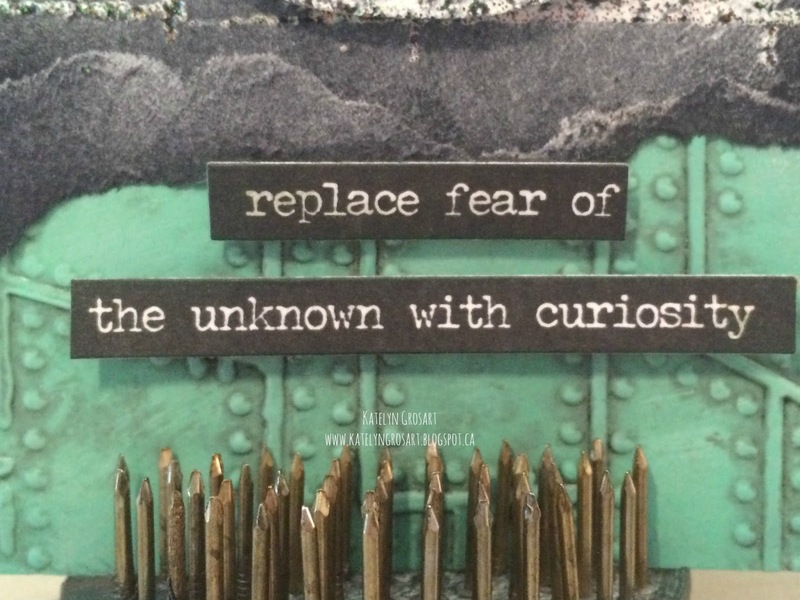 Tim Holtz Kraft Core - #13 & #19. 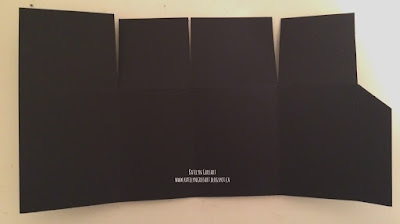 Bazzill Cardstock - Black. 1 3/8" Circle Punch. To begin making my card, I coloured two sets of the cherry blossom image with Worn Lipstick and Spun Sugar Distress Markers. Once all the images were coloured, fussy cut them out and inked the edges using Black Soot Distress Ink on a blending tool. 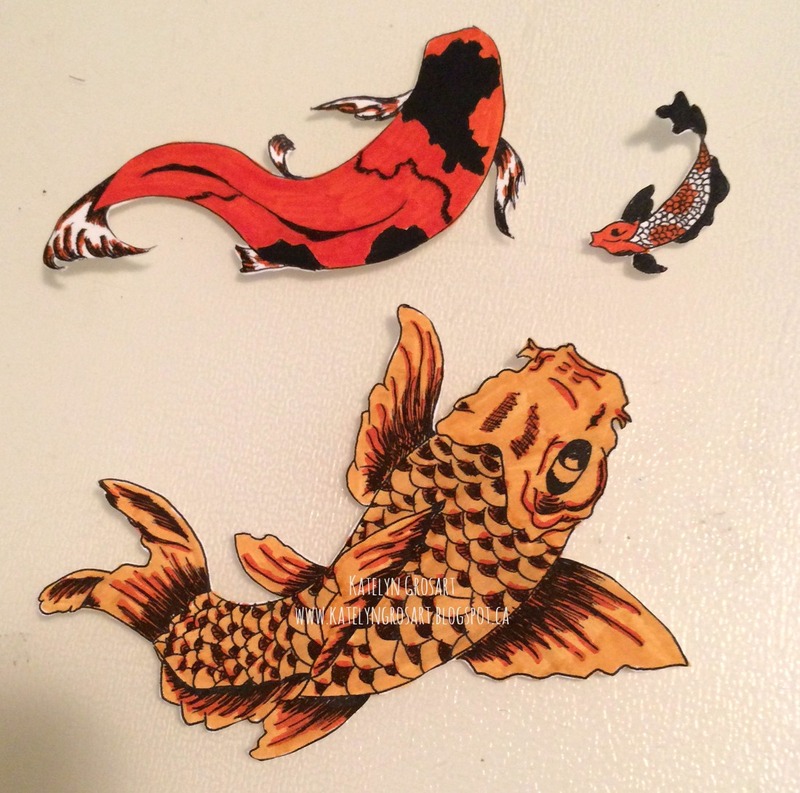 After the Cherry blossoms images were fussy cut out and inked, I moved on to colouring the Koi. For the Koi you will need two sets of the Koi images. To colour them I used Carved Pumpkin, Dried Marigold, Spiced Marmalade and Black Soot Distress Markers. Once the I was happy with the colouring, I fussy cut all the Koi out and inked the edges using Black Soot Distress Ink on a blending tool. 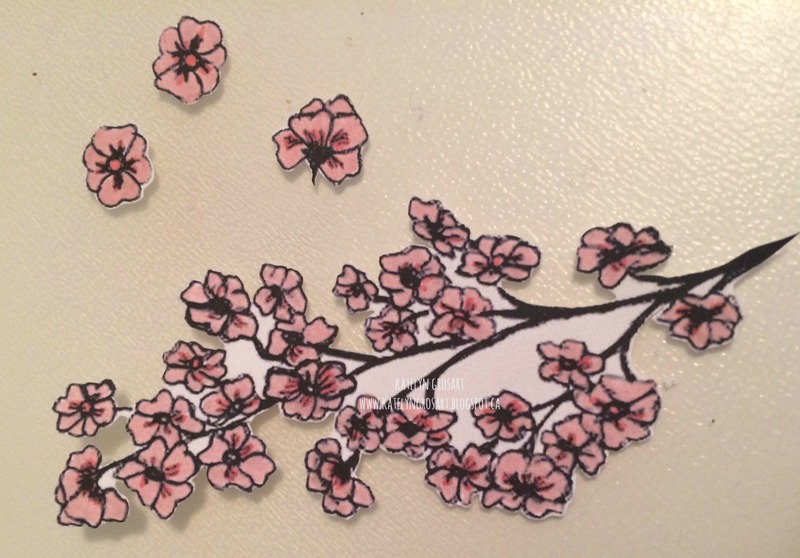 For the saying, it is found on the Cherry Blossom set. I stamped it and then inked over top of it with Antique Linen Distress Ink on a blending tool. Once I was happy with the colour, I trimmed out the saying into two strips. Love this saying that Nicole Wright Designs incorporated into the set. 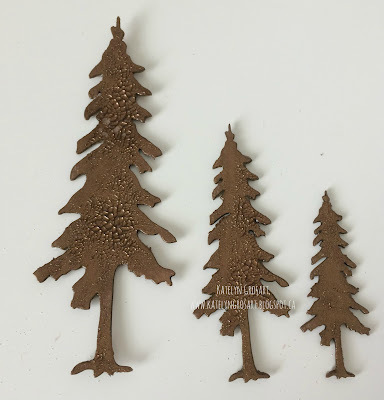 To create the Pop Up Box card, I followed a tutorial the I found on the Split Coast Stampers website, here is the link so you can create it at home: http://www.splitcoaststampers.com/resources/tutorials/popupboxcard/. Below is what the Pop Up Box Card will look like before assembly. Before attaching the box together, I cut out panels using Graphic 45's Bird Song Paper and Tim Kraft Core paper #19. Once these were cut I inked them using Black Soot Distress Ink on a blending tool. After the panels were cut, I adhered them to the small panel pieces to the small panels and the loong panel pieces to the long inside panel. Once the panels were adhered, place adhesive on the tab and attach the tab to the outside of the long panel. Once the box is adhered together, cover the outside tab using a piece of Tim Holtz Kraft Core #19. Before decorating the inside, you will want to attach the inside centre piece. 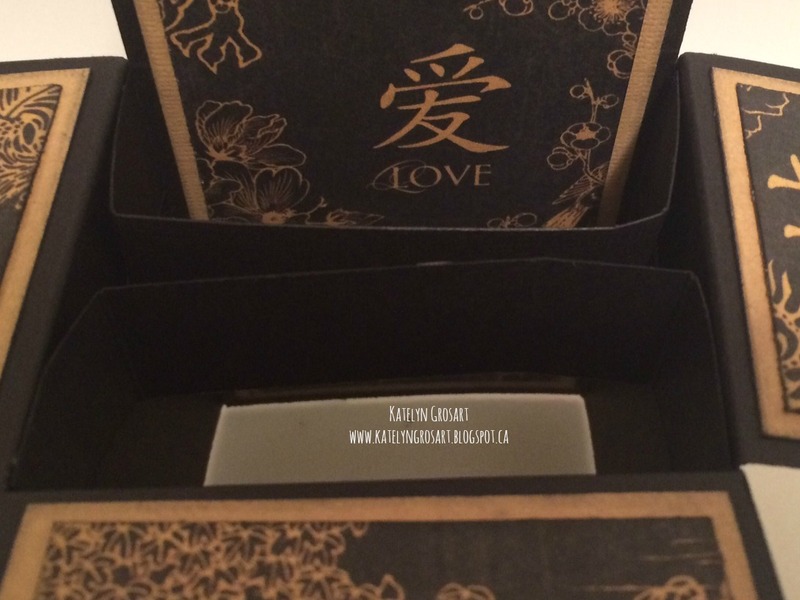 This will allow for attaching the Koi and Cherry Blossoms to the inside of the card. After the inside support pieces are in place, now it is time to decorate. I used a variety of the Koi images, cherry blossoms and the saying and placed them throughout the inside of the pop up box. An extra piece I added was 1 3/8" circle lily pad out of the Tim Holtz Kraft Core #13. To top off the lily pad add a cherry blossom petal to the top of it. Once I was happy with placement of all of the images, I adhered some pieces with adhesive and other pieces with foam squares, to give it some extra dimension. Here is my Pop Up Box card with all the aspects together. This card was a ton of fun to make and with the beautiful stamped images from Nicole Wright Designs, it created the perfect combination! 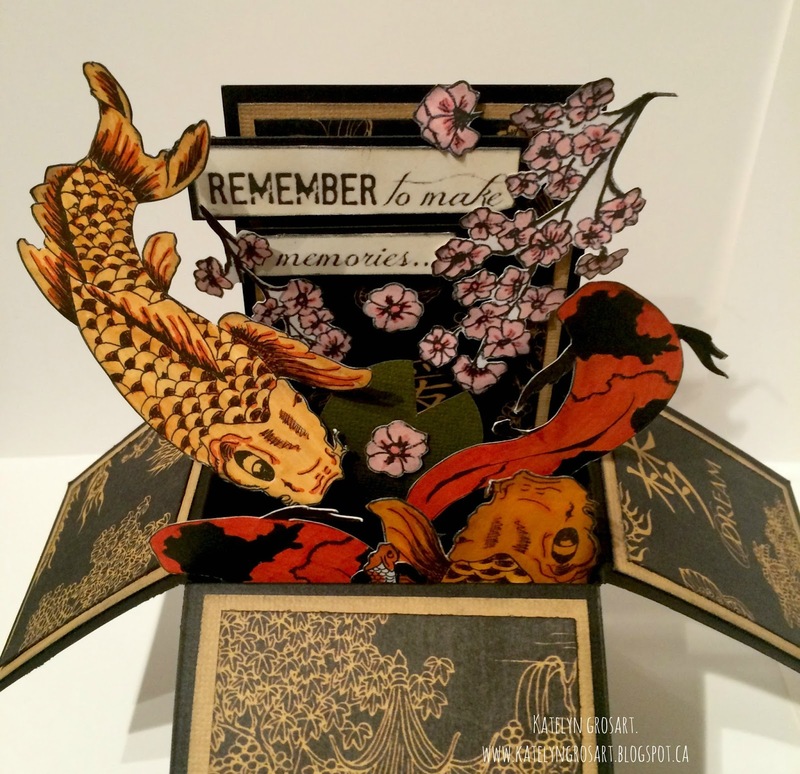 Thanks for stopping by and checking out my Pop Up Box Card. Make sure that you continue to check back over CHA week as there will be other projects featuring Emerald Creek Craft Supplies products. I'm back on the Southern Ridge Trading Company blog today featuring a winter scene card for their January's Monthly Challenge. We would love for you to share your projects with us, to do this, you can head over here to read all about the challenge and how to enter your piece or pieces. 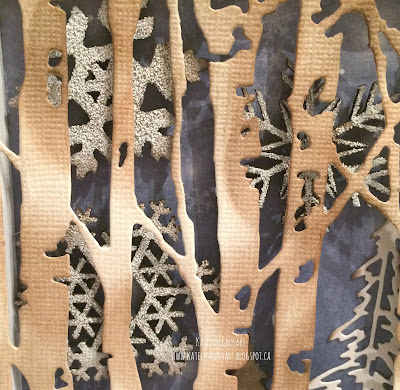 Supplies Used: SRTC - Snowflake Chipboard & Cedar Tree Chipboard. Emerald Creek - Soft Fallen Snow Embossing Powder. 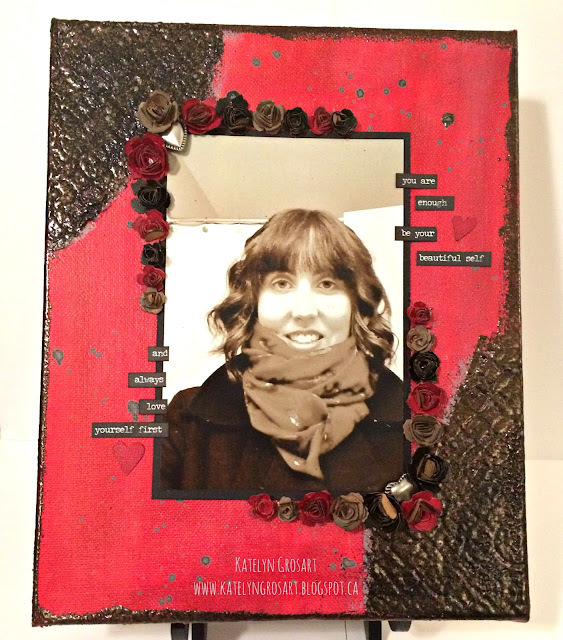 Tim Holtz/Ranger Distress Ink: Ground Espresso & Vintage Photo. 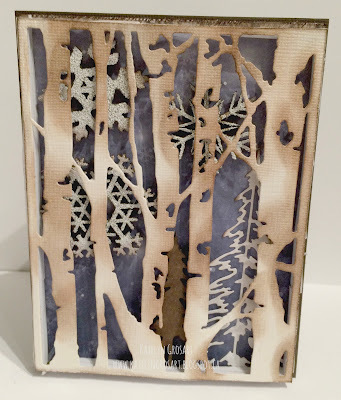 Tim Holtz/Sizzix - Woodlands Die & Birch Tree Die. Imagine Crafts/Tsukineko - Silver Delicata. Bazzill - Brown & Cream Cardstock. Bo Bunny Sleigh Ride - Sleigh Ride, Flurries & Blizzard. 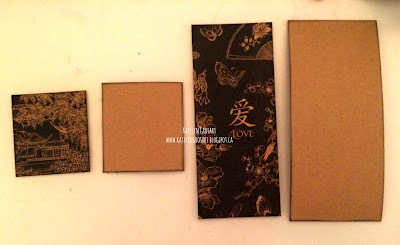 I started by covering the Cedar Tree chipboard piece with Ground Espresso Distress Ink. Once the Cedar Tree was finished, I moved on to working on the Snowflakes 713 and 714. I wanted to have some shine coming through the embossing powder, so I added a layer of Silver Delicata. Becuase the Delicata takes longer to dry, I added Soften Fallen Snow Embossing Powder from Emerald Creek Craft Supplies over top of the snowflakes and then heated up the embossing powder. When they were all embossed, some ended up with patches that didn't get a lot of embossing powder, so I added some Ground Espresso Distress Ink over top to give them more of a vintage look. Some finishing touches that I added was the Woodlands tree from Sizzix/Tim Holtz, where I inked the edges in Ground Espresso Distress Ink. 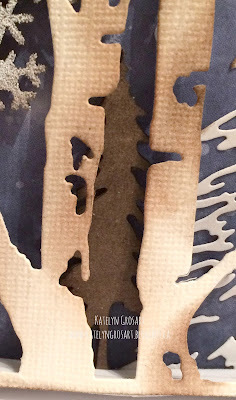 As well as the Birch Tree die from Sizzix/Tim Holtz, where the knots on the trees were, I blended Vintage Photo and Ground Espresso over top to make the birch trees pop. Thanks for taking the time to check out my card! Stay tuned for some CHA projects on the blog the rest of this week and next week.